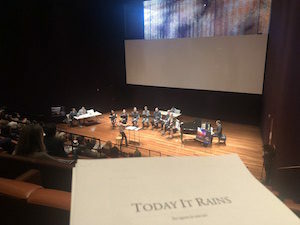 The journey for OP’s world premiere of Today It Rains celebrated another milestone May 29-31 with a long-anticipated series of workshops at UC Santa Cruz. Co-commissioned by American Opera Projects (AOP) from an original concept by Pulitzer Prize-winner Mark Campbell, Today It Rains tells a story inspired by a real event in the life of American artist Georgia O’Keeffe. The 80-minute chamber opera will premiere in San Francisco in March 2019, followed by a New York production in Fall 2019. The TIR creative team–composer Laura Kaminsky and co-librettists Mark Campbell and Kimberly Reed–were in residence for the workshop series, along with OP Artistic Director Nicole Paiement, Creative Director and Production Dramaturg Brian Staufenbiel, AOP General Director Charles Jarden, and AOP Producing Director and Production Dramaturg Matthew Gray, all eager to hear the piece for the first time. On Tuesday, the work began with Nicole Paiement at the podium and OP Resident Pianist Keisuke Nakagoshi at the piano, covering the complete orchestra reduction. 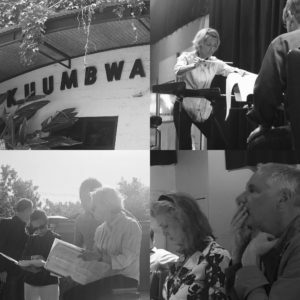 Singers sang through various scenes, while the Artistic team weighed in evenly with pacing, word suggestions, tone, and dramaturgy. 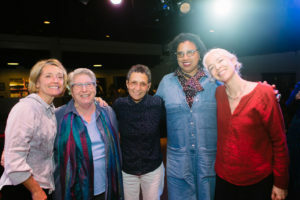 Tuesday night welcomed poet laureate Robin Coste-Lewis and Art History professor Jennifer Gonzalez to join Nicole Paiement and Laura Kaminsky for “Always Moving Uphill: Women in the Arts”, a conversation at the Kuumbwa Jazz Center moderated by Feminist Studies chair Bettina Aptheker. Panelists shared why they are born to do what they do, discussed societal obstacles they have overcome, and debated about the the appropriateness of defining something as having “feminine sensibility.” Snaps, applause, and inspired sighs abounded. It was truly a night to remember. On Wednesday, the artists were back at it, working for 6 hours toward a first full run through to gauge the opera’s pacing and storytelling arc. On Thursday, the final day, the workshop performance was held in front of a packed standing-room-only audience, followed by a lively Q&A session led by Nicole Paiement; afterward, the team celebrated their hard work at a reception with UCSC’s Dean of Arts Division.